In late 2016, we predicted that video website home pages would become a huge website trend for 2017. AUSDOG is our latest website to feature this video technology. Do yourself a favour and see it for yourself. Then imagine the possibilities for your business in your industry. With video content, you have the opportunity to get creative and to think outside of the box. Video home pages grant you the opportunity to showcase what your business has to offer in a way that pictures can’t. The good news is that video backgrounds allow you to promote your business in a way that is different, attention-grabbing and overly beneficial to the web user experience! Think of it as a subtle cross between a website and TV! Can’t get access to your own content? Well, there are always stock photo search engines like iStockPhoto.com which can give you access to pre-recorded videos for a small fee. As dog and puppy training experts, AUSDOG takes a distinctive and professional approach to training family pets. 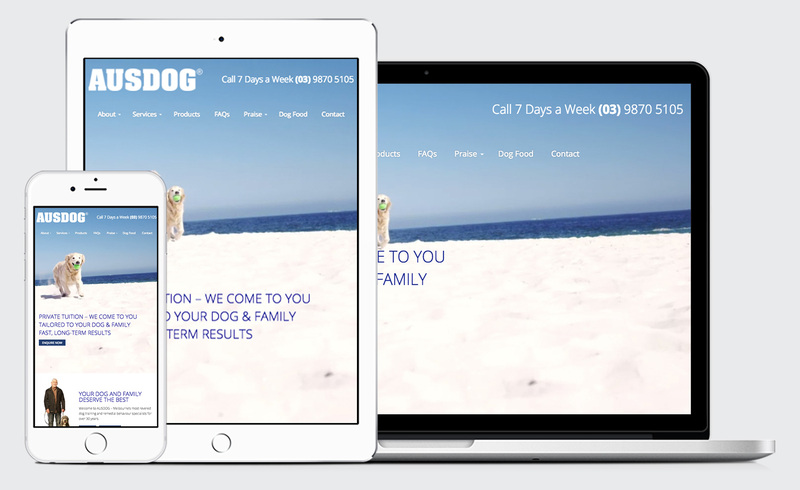 AUSDOG first came to Webtron asking how they could make their website stand out as being ‘individual’ and ‘progressive’ – to emulate their professional and unique style of dog training. This was when we suggested the video homepage. Just like we did in reinventing the RVAC.com.au pilot training website last year. It’s likely that AUSDOG are the first in their industry to apply this video background styling to their website. This new website allows AUSDOG to lead the puppy and dog training industry by storm! Webtron’s clients have websites that take advantage of these trends before they hit the masses. Our clients like AUSDOG, RVAC and Jim’s Mowing have recently opted for video backgrounds on their new websites. Want to be the first out of your competitors to have an attention grabbing video website? Webtron has the in-house development team to help make the new video trend a centrepiece for your new site. Ask us about the video trend now on 1300 932 876!